The aftermath of the U.S. presidential election has been fairly sober. The sporadic rioting in a number of cities scattered across the country was essentially the mindless hooliganism that arises after some sporting events attended by large numbers of drunken or otherwise crazed partisans. 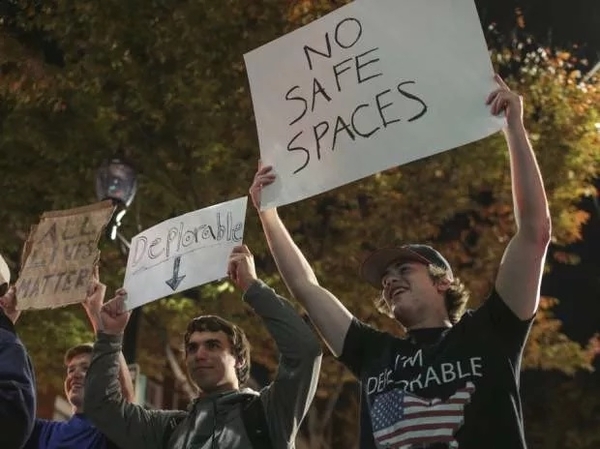 In Portland, Oregon, a state that Hillary Clinton won by a heavy margin, the majority of the 120 or so alleged disturbers of the peace had not troubled to vote, causing the immediate objective of the disorder to be obscure. This activity can't really pass as protest, which to be authentic, requires a clear message, organization, and some restraint. The United States has a population of about 315 million and 45 metropolitan areas with more than one million people in them, and what occurred for a few days after the election, though portrayed in much of the world as the beginnings of a popular revolt, was little more than the customary number of misfits and goons seizing a pretext to vandalize shop windows and throw projectiles at the police, until the constabulary response becomes inconveniently discomforting. It was a tiny and inchoate frothing on the surface of the advanced world's most complicated nationality. The physical plant of American universities has only become so immense because it was assumed that "education" was the gateway to universal prosperity, which to some extent was true; and the promotion of it was politically popular beyond any analysis of the return on the public (or private) funds consecrated to it. The process was parallel to the practice in the private sector of financiers, industrialists, and the executive leadership of large corporations smarting under the condescensions of the learned professions — architects, clergy, to some degree medical doctors, holders of post-graduate degrees in the humanities, but especially the ubiquitous and horrifyingly overpaid practices of the legal community, paddling and frolicking in the 360-degree monopoly cartel that shelters behind the multi-purpose aegis of the rule of law. We all believe in that rule, but not, if we were consulted, as we will be eventually, in the exploitation of it by the legal priesthood to run a trans-social, cross-institutional shake-down operation on our entire civilization. Captains of industry and titans of finance have rebelled against this, not by impugning the right of the legal cartel to use its control of legislatures to produce herniating masses of new laws and regulations that lawyers must argue about in courts presided over by lawyers elevated to the bench, but by trying to qualify business as an academic subject, and dispensing billions of dollars of their shareholders' and their own money to propagate the myth. It isn't; it is experience and intuition, and almost none of the world's great people of commerce learned about business academically. They learned by doing it and becoming bigger and richer and smarter as they grew. At this point, persevering readers may be wondering what this has to do with the U.S. election, the subject I opened with: the reaction of many American universities to the presidential election was enough to discourage the most ardent adherent to the fairy tale of the pristine impartiality and fearless pursuit of wisdom of America's vast and hideously expensive academia. The U.S. election went off without incident on the day: there were no charges of stuffed or vanished ballot boxes, (unlike 1960; the voting boxes for some of Nixon's districts in prosperous North Chicago are still missing), or of false voting lists. Only 52 per cent of eligible voters voted, indicating a lack of enthusiasm for the candidates, but there were no contested results or objectionable incidents at the country's approximately 100,000 polling places. Nonetheless, academia fluttered concernedly. The Dean of Williams College offered, as my friend Roger Kimball of the New Criterion called it, a post-electoral "emetic" to her campus community: "Many (students and faculty) are feeling acutely upset, overwhelmed, and frightened this morning. Please take this opportunity to reach out to your classmates, to offer support, to be open to discussion, to be ready to listen, and to remind everyone you see on campus that our community stands ready to support all of us." This wasn't reaction to the attack on Pearl Harbor, the atomic bombing of Hiroshima, or 9/11, it was the aftermath of a completely orderly American presidential election, for the 54th consecutive time. The director of the LBGTQ Center at Princeton (the university of James Madison, chief author of the U.S. Constitution, and of Woodrow Wilson, and where Albert Einstein was a faculty member), put it out to her community, "I know that many of us may be feeling shock, confusion, fear.... (We) are here for you as you process.... All emotions you may be having now are valid," presumably including that of the majority of American voters, including the Libertarians: the satisfaction that the country was about to see the last of the Clintons, Obamas, and Bushes as major public figures, unless Chelsea Clinton or the (very ingenuous) Obama daughters, or a young Bush rise through the ranks and become president as the latter Adams and Roosevelt did, a generation after their presidential relatives. Those were meritocratic dynasties, not cartels passing the greatest offices in the United States around among themselves as we have seen in the last 30 years. The administration of Cornell University held a "cry-in" where students were furnished with materials to express their feelings. Students at Bryn Mawr called for "a day to heal after we've been told the country doesn't value our existence at all. A Trump election directly endangers the lives of all students at Bryn Mawr College that are people of LGBTQA+ (the last two an emerging mystery), non-Christian, and female." How are they threatened? Donald Trump ran against almost everyone of any stature in the post-Reagan Republican Party except Bob Dole; all the Democrats; almost all the media and the pollsters, and certainly the snivelling and pathetic whelps of unearned privilege who seem to compose the mood music in and around the Ivy league. Anyone who could incite such orgiastic self-pity from those whose fate is by any normal measure enviable, is a persuasive candidate whose election is timely. Whatever the new administration does, the university as we know it is a dead pigeon. The entire process will be on-line, except for graduate centres of advanced studies, in fabled ivy-covered buildings, and the vast campuses built by striving capitalists and questing politicians, will be re-purposed. Trump has a clear mandate to reform campaign financing, as the only candidate to finance his own campaign except Sanders; to reform taxes, against the velocity-of-moneyed Wall Street hustlers and for the middle and working classes and small businesses; reform of immigration and disadvantageous trade pacts (which should not include that with Canada, a proudly fair-trading country), health care (including Trump's pledge to seek universal medical care); and a redefinition of the national interest between George W's mindless plunging into foreign war and Obama's distressing charade of appeasing America's enemies, while being, as President Carter's national security advisor Zbigniew Brzezinski put it on Fareed Zakaria's program last Sunday: "engaged but ineffectual." Americans have elected a president with fewer votes than his chief opponent for the sixth time, flung out those who have generally misgoverned them for 20 years, and voted for a traditional reform program. It is interesting to see how profound and desperate are the postpartum blues of those who have ruled the conventional wisdom with an iron rod for nearly 20 years. While eminent American universities and colleges comfort those afflicted by the election, some close personal relationships of mine of long standing have been strained or broken by this election as if it were a civil war. I myself have received in astonishment, the peevish, churlish termination of the continued receipt of my pieces in the National Review by a learned and well-regarded academic administrator and historian who has been a friend for 50 years. I face up to the wrath and orchestral sorrow of the grumpy with fortitude; America has shown again the genius of renewal, as it did, though with not so evidently or likely a distinguished champion, in 1828, 1860, 1932, and 1980 (Jackson, Lincoln, FDR, and Reagan). Someone had to drain the swamp, and Donald Trump was the only person on offer to do it. He attacked racial prejudice on Sunday night on network television, and went without security to the 21 Club the night before. The cry-ins and the "process" will run their course, but so far, the Trump era has had an auspicious start, and the fatuity of his opponents shows that.